For quantitative determination of lipase activity. • Sensitive and accurate. Linear detection range 40 to 1600 U/L lipase activity in 96-well plate assay. • Convenient and high throughput. The procedure involves adding a single working reagent, and reading the optical density at 10 min and 20 min at room temperature or 37°C. Can be automated to process thousands of samples per day. LIPASE catalyzes the hydrolysis of ester bonds on the glycerol backbone of a lipid substrate. In humans, pancreatic lipase is the key enzyme responsible for breaking down fats in the digestive system by converting triglycerides to monoglycerides and free fatty acids. Human pancreatic lipase and its related protein 2 are the main lipases secreted by the pancreas. In acute pancreatitis, lipase levels can rise 5 to 10-fold within 24 to 48 hours. Increased activities have also been associated with pancreatic duct obstruction, pancreatic cancer, kidney disease, salivary gland inflammation, bowel obstruction, and other pancreatic diseases. Decreased levels may indicate permanent damage to lipase-producing cells in the pancreas. Simple, direct and automation-ready procedures for measuring lipase activity are very desirable. BioAssay Systems’ QuantiChrom™ Lipase Assay is based on an improved dimercaptopropanol tributyrate (BALB) method, in which SH groups formed from lipase cleavage of BALB react with 5,5’-dithiobis(2-nitrobenzoic acid) (DTNB) to form a yellow colored product. The color intensity, measured at 412 nm, is proportionate to the enzyme activity in the sample. 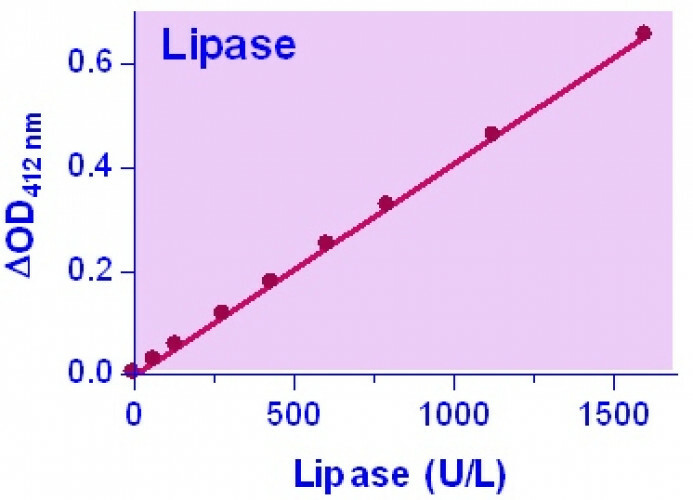 Applications For quantitative determination of lipase activity. References Assay: Lipase in Nematodes C.elegans larvae (Pubmed). 2. Gabbi, C et al (2008). Pancreatic exocrine insufficiency in LXRbeta-/- mice is associated with a reduction in aquaporin-1 expression. PNAS 105(39):15052-7. Assay: Lipase in Mouse Serum (Pubmed). 3. Qatanani, M et al (2009). Macrophage-derived human resistin exacerbates adipose tissue inflammation and insulin resistance in mice. J Clin Invest 119(3):531-9. Assay: Lipase in Mouse Muscle tissue (Pubmed). 4. Nachnani, JS et al (2010). Biochemical and histological effects of exendin-4 (exenatide) on the rat pancreas. Diabetologia 53(1):153-9. Assay: Lipase in Rat Serum (Pubmed). 5. Mudgil, Y et al (2009). Arabidopsis N-MYC DOWNREGULATED-LIKE1, a positive regulator of auxin transport in a G protein-mediated pathway. Plant Cell 21(11):3591-609. Assay: Lipase in Plant Recombinant NDL proteins (A.thaliana) (Pubmed). 6. Freitag, TL et al (2010). Human risk allele HLA-DRB1*0405 predisposes class II transgenic Ab0 NOD mice to autoimmune pancreatitis. Gastroenterology 139(1):281-91. Assay: Lipase in Mouse Serum (Pubmed). 7. Tonsberg, H et al (2011). Effect of bile on the oral absorption of halofantrine in polyethylene glycol 400 and polysorbate 80 formulations dosed to bile duct cannulated rats. J Pharm Pharmacol 63(6):817-24. Assay: Lipase in Rat Intestine (Pubmed). 8. Hasan, F et al (2009). Methods for detection and characterization of lipases: A comprehensive review. Biotechnol Adv 27(6):782-98. 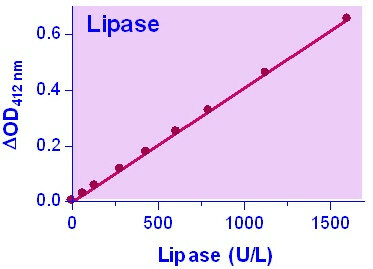 Assay: Lipase in various enzyme extracts (Pubmed). 9. Hu, M et al (2010). Effect of prolonged starvation on body weight and blood-chemistry in two horseshoe crab species: Tachypleus tridentatus and Carcinoscorpius rotundicauda (Chelicerata: Xiphosura). Journal of Experimental Marine Biology and Ecology 395(1-2):112-9. Assay: Lipase in Horseshoe crab Blood (Pubmed). 10. Molinari, CE et al (2011). The effect of storage at 25 ?C on proteins in human milk. International Dairy Journal 21(4):286-293. Assay: Lipase in Human Milk (Pubmed). 1. Narbonne P, Roy R (2009). Caenorhabditis elegans dauers need LKB1/AMPK to ration lipid reserves and ensure long-term survival. Nature 457(7226):210-4. Assay: Lipase in Nematodes C.elegans larvae (Pubmed).